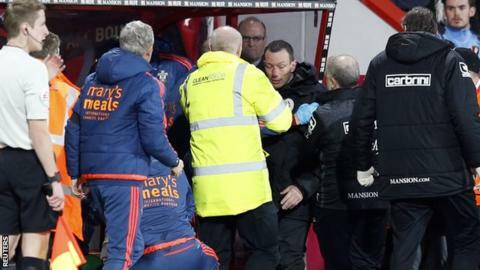 Fourth official Kevin Friend collapsed and hit his head on a dugout during Tuesday's Premier League game between Bournemouth and Southampton. Friend, who cut his face, was treated in the tunnel before being taken to hospital, where he stayed overnight. The incident happened as the first half came to an end at the Vitality Stadium. The start of the second half was delayed by five minutes as Friend was replaced by Dean Treleaven, a qualified referee who was watching the match. "I was on the bench and he came to us and he fell against the dugout, with his nose, and then fell to the ground," said Saints boss Ronald Koeman. "For maybe five seconds, he was out of everything." Bournemouth manager Eddie Howe, whose side won 2-0, added: "I saw him collapse. I saw him very dazed and shaken."